The RET gene encodes for a transmembrane receptor with tyrosine kinase activity. It is involved in cell proliferation, migration, differentiation, and in neuronal navigation. RET rearrangements occur in 1% - 2% of patients with adenocarcinoma. Alectinib is a highly selective next generation ALK inhibitor that has demonstrated potent anti-tumour activity in RET rearranged NSCLC in preclinical studies and early phase trials. 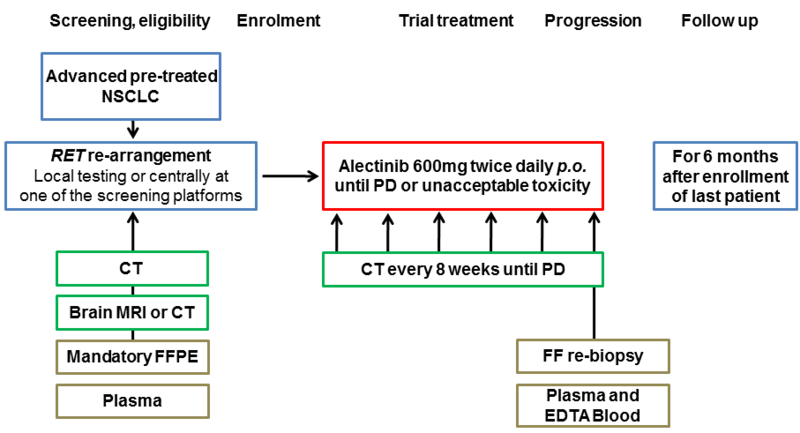 The aim of this trial is to evaluate the activity of alectinib as second-line treatment of pre-treated RET-rearranged advanced NSCLC.